I’ve heard so many good things about gelatin and I’ve been wanting to give it a try, but just haven’t had the extra $$ in my grocery budget to give it a go. I keep coming across recipes that call for it and have to save them for later. A few weeks ago an opportunity came up that I had a little extra in the budget and an chance at a fantastic deal. 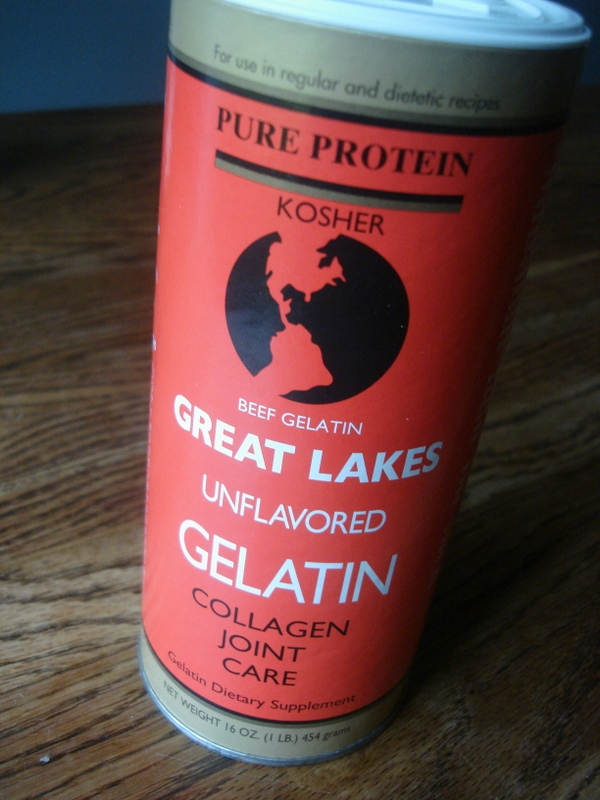 So I finally got my hands on two canisters of grass fed beef gelatin! I’m SO super excited! The first two recipes I want to try are jello and marshmallows. The jello is a favorite for hubby and the marshmallows always kills me when I buy them at the store and look at the ingredient list. Even the ‘natural’ ones still have food dye in them!!! So this is a great medium to help make different foods that I’m interested in making healthier for my family, but there are actually a ton of health benefits in the gelatin itself. Especially if it is from a good source. I’ve heard great things about the [amazon_link id=”B001ELLBJS” target=”_blank” container=”” container_class=”” ]Great Lakes[/amazon_link] brand which is what I purchased, but I’ve also heard the [amazon_link id=”B00014EO2A” target=”_blank” container=”” container_class=”” ]Bernard Jensen[/amazon_link] brand is good as well. So what are these other added benefits? Well… they are many… but we will take a look at a few. Sally Fallon in Nourishing Traditions speaks of the benefits and also has a few recipes that call for it. But she mostly refers to it being one of the important properties of homemade bone broth. And it can also help with weight loss! There are other benefits, but these are the simplest and most common. There are also some other ideas how to use it on WellnessMama and Savory Lotus that I would recommend checking out. I will hopefully keep you posted as I find new uses for the gelatin and as I look for new recipes to try! I think my kids are most interested in the vitamin gummys and making gummy candies! 😉 I think these are easy enough and I may even have them give me a hand! Although I may regret that if they are that easy to make and they start doing it themselves! 😉 Ok, not really, but I’m sure they will ask for them more often! Have you used gelatin before? What have you used it for? Any good recipes to share? Please let me know!